Non-conforming suites are those that may have met building codes at the time of construction – but do not meet present-day codes. “I’d say we are quite supportive. We even sometimes host a type of workshop that helps people through the approval process,” says Dietrich. Although some of these issues were of concern to the Courtneys’ neighbours, none of them appealed the development. Instead, they sorted out their issues personally instead of resulting to a City-held hearing, which is the norm in Calgary. In the Courtneys’ case, they were the third house in their neighbourhood to pursue a development – out of 300 houses. 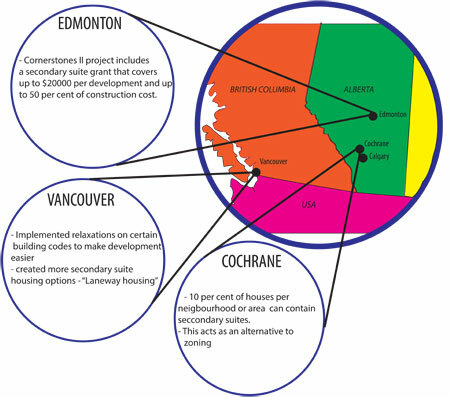 This grant is part of Edmonton’s Cornerstones II housing initiative – a five-year plan scheduled to run from 2012 to 2016. According to the City of Edmonton’s website, the first Cornerstones project, which ran from 2006 to 2011, helped create and improve 553 secondary suites. 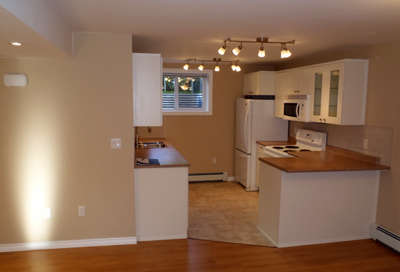 From Dec. 1, 2007 to Sept. 10, 2013 there were 1,502 basement suites, garden suites and garage suites, says Hickmore. “The majority of those are basement suites because they are easier to approve,” she says. Calgarians have been struggling to find affordable housing, but Vancouver’s housing market has even more problems with affordability. “A single student can’t be paying $1,000 a month to live here,” says Littlefoot, who rents basement suite with three other people for $3,000 per month including utilities. “We actually have tons of parking space, which was a big factor when I was looking for a place,” he says. This may have discouraged renters in the past, but for Littlefoot, he’s just glad it cuts time off the commute to school.